©Bert Gildart: Janie and I departed Montana January 10, and we’re now on the last leg of our trip, visiting family and friends on the East Coast. After that we’ll be driving back to Montana, trying with all of our might to miss the Chicago area, which we think rates with Houston, Texas, as being one of the worst cities in America for driving. If all goes well, we should be back home by mid-May. In the meantime, I have been meaning to post photographs on one of the areas we’ve recently visited, and that is Natchez Mississippi, with it much heralded Spring Pilgrimage. While in Natchez we had marginal reception, which surprised us as Natchez is a fairly large area. However, it is one of the few areas of the country in which our Verizon card does not work well. Each year, Natchez opens it beautiful antebellum homes from about the first week in March through the first week of April. 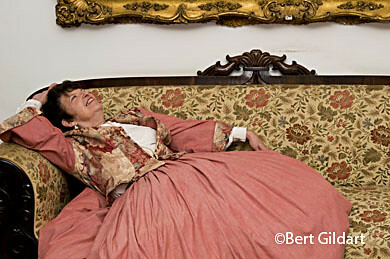 During this time, visitors to Natchez, Mississippi’s annual Spring Pilgrimage can step into the mid-nineteenth century. The five week festival of pre-Civil War life offers antebellum home tours, gospel shows, light comedy and carriage rides amidst a town now lavished with azaleas and fragrant smelling wisteria. In the 1840’s Natchez claimed more millionaires per capita than any other city in America. 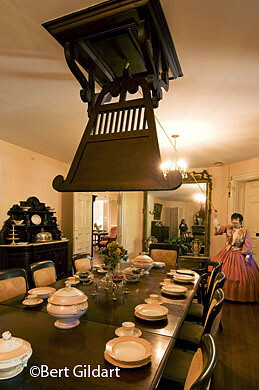 The twenty-five late colonial and pre-Civil War townhouses, mansions and plantation homes open for touring during Spring Pilgrimage attest to the fortunes made in nineteenth century Natchez by cotton planters, bankers and other entrepreneurs. Natchez survived the Civil War far better than did many southern towns and boasts more pre-1860 buildings than any other U.S. city of its size. The town claims thirteen National landmarks and more than 1000 buildings listed on the National Register–all rich, as their press release says, “in history and decorated with finely crafted furnishings and traditions of genuine southern hospitality.” This is not hype, and once again, Janie and I can attest to the fact that Natchez has homes worthy of a special trip. As a working journalist, Janie and I were treated like royalty. We were provided press passes, but more than that were allowed privileges not available to the casual visitor. That meant access to unusual parts of old homes, and that was great. In several cases, it also meant a demonstration of the way in which early day devices were used. And it meant I could use a tripod and make judicious use of flash. Though I found natural light worked wonderfully well, still it require the cooperation of the subject, as in the case of Gay Guercio pulling the rope to swing the massive Punkah. In other cases, I used Nikon’s slow syn which fires the strobe at what ever f-stop I’ve set the camera. Duration of the exposure can be anything longer than 1/60th of a second, which would default strobe setting. This means the camera combines natural light with artificial light, which in this case created an interesting blend of colors. Those were the techniques I used in all the homes we visited over a period of about five days, to include the several park service homes. All of the antebellum mansions were spectacular, but today, I want to tell you just a little more about Longwood, the largest octagonal house in the United States. Another room contained the “Fainting sofa,” which was open at one end. The sofa allowed a young lady (seeking the attention of a suitor) to suddenly grow light headed. With a sofa nearby, she could recover by collapsing as also demonstrated for us by Ms. Guercio. Dr. Haller Nutt built Longwood but work on the home halted in 1861, at the start of the Civil War. Dr Haller died in 1864 of pneumonia leaving the work incomplete. And so it remains today. Still, Longwood was the last burst of southern opulence before war brought the cotton barons’ dominance to an end. 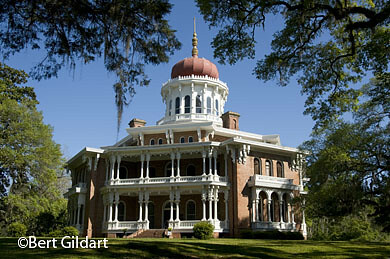 Fortunately Longwood survived decades of neglect and near-abandonment to become one of Natchez’s most popular attractions. Being courted, and feeling faint? The Old South had a sure fix with its "Fainting Sofa," no arms at the other end. Longwood was, of course, only one of the beautiful mansions we visited, and in my next posting I’ll describe several of them. This entry was posted on Monday, April 27th, 2009 at 7:41 am and is filed under Photography, RV Travel, Travel. You can follow any responses to this entry through the RSS 2.0 feed. You can leave a response, or trackback from your own site. As you know, we too were just along the “Trace” and spent some time in that famous city. Sandi, my wife expressed some interest in how the local black population (many of them too are directly related to the local slave population from the 1800’s) feel about this “celebration” of the “grand and gracious lifestyle” made possible only by the use of slave labor. While at the visitor center she asked a young lady employee (who just so happened to be black) if a visit to the plantation ruins was worthwhile. The young lady responded that she had never been there because she said “she guessed she never had any interest in that.” Sandi asked if she would mind another question. “OH OH, OK go ahead.” Sandi asked how she felt about all of this hoopla about “southern living.” She thought and responded that she just sort of shut it out of her mind and was grateful that she didn’t have to live under that type of rule and discrimination nor during those times. She said “she just had to believe that the accounts of brutality and degradation were only isolated cases and that most slaves were treated more humane.” This kind-hearted lady said she appreciated Sandi’s question and went on her way. From what I have read, humane treatment was more the exception than the rule. Fear and intimidation kept this “peculiar Institution” operating.